After successful completion of the Cat B course, a student may join a Field Experience phase, in which competence assessment will take place in a controlled working environment. Tjerk Bouma changed jobs, but his new employer RWS (Rijkswaterstaat North Sea) supported him to complete this Field Proficiency Period. Tjerk recently logged the required 365 operational days in his task book. With that he completed his Field Proficiency Period. 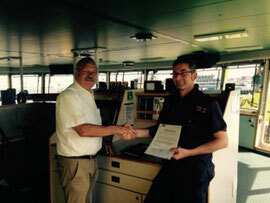 We were pleased to hand him his FIG/IHO/ICA Certificate of Field Proficiency on board the hydrographic survey vessel “ARCA”. We wish him success in his hydrographic career. A company that specializes in hydrographic training and courses for the hydrographic survey, dredging and offshore construction industry since 2000.